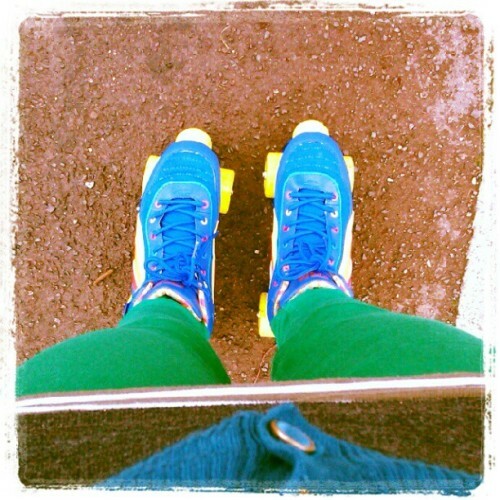 I spotted these skates on someone else a long while ago and ever since have been itching to have a go. Some of you may remember reading a while back that I spent some time over the jubilee weekend in a pair of borrowed in-line skates. It fuelled my desire to get back into skating. I have always preferred traditional wheels to in-lines though. Much more retro looking I think as well. Reminds me of my childhood. I mentioned as much to skates.co.uk and they very kindly offered to send me a pair to review. I can wholly recommend their customer service and the speed of delivery was amazing, they were with me in under 24 hours! At first, I wore them around the house (only downstairs, obviously!) much to Ethan's amusement. Hubby just assumed I was some sort of roller waitress and kept asking me for service (no, dirty minded one!!). Anyway, once my confidence was up, I took to the streets, not caring what the neighbours thought of a 30 year old wobbling up and down the road. As it happens, these things are amazing at helping me keep up with Ethan on his bike. They are really going to come into their own in a few days though, because Ethan is getting a pair of adjustable skates for his birthday (Sunday) so I'm going to be able to teach him! I will be investing in knee pads for both of us though. I took a tumble last week and ouch! It hurts when you land on your knee. So please folks, if you are setting out on skates, wear protection! I have found these skates easy to get a grip with. They are responsive, the wheels are very smooth. They are extremely comfy to wear and just look fantastic. I like to team them with leg warmers for a proper 80s feel. You know what? Skating is bloody hard work, so just think about the toning and calorie burning going on! Get a pair, you need them in your life! They will help you chase down your toddler! Here are quite simply the coolest quad skates available at the moment. The Rio Roller disco skates will wow anyone who sees them and as well as looking too good, the spec is tip top too! The boot is a semi soft design with a solid exterior heel plate. The trucks are made from hi impact aluminium and the wheels are SFR 54mm and these have ABEC 5 bearings which are super smooth and keep you at the disco until the early hours! They are very cool looking skates, bring back memories of roller disco back in the 80's. Thanks for commenting over on ThriftBee. By the way, I've not forgotten you tagged me in that meme, I've just not had time to dedicated to it yet, but I will do! These are so cute!! I remember going to the skating rink when I was younger and we always had the best time. I need to get some roller skates for me and the kids! Oh, you really need to! Glad you like the skates!! Check out our website rioroller.com and maybe join us on Facebook!